Lina Inverse and Gourry Gabriev have teamed up again along with their friends from the original Slayers TV series to save an indulgent village from the wrath of an underwater nemesis. Lina thinks spending a little time by the seaside will afford her some much needed R&R, but little does she know the action is about to begin! After accepting their much awaited reward of seafood delights from a fishing village, Lina and Gourry discover that the village food supply has been cursed. Whoever eats the food loses their ability speak in anything but a bizarre aquatic language. Lina must brave the perils of the deep to get to the bottom of this mysterious hex on humanity. And what would Lina say about the feeling Gourry is trying to tell her - if she could only understand this strange tongue? 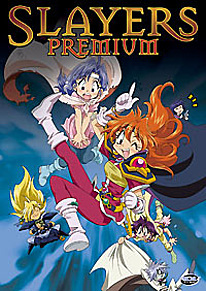 DVD Features: commentary by Cynthia Martinez (Lina) & Crispin Freeman (Zelgadis); behind the scenes with Crispin Freeman; Slayers: Premium trailer and previews.